SINGH SAAB THE GREAT too maintains an iron grip on emotions and sentiments. Like GADAR, the emotional chord is between the couple and also between the brother-sister this time. But what weighs the film down is the conflict with the antagonist. It’s predictable and one feels that the issue of an honest citizen waging a war against the corrupt has been done to death. On the whole, SINGH SAAB THE GREAT is atypical Sunny Deol film that a section of the audience still enjoys. The clapworthy dialogue, the raw appeal, the undercurrent of emotions and of course, the dhaai kilo ka haath should appeal to those who relish desi fares, especially the single screen audience. Early in Singh Saab The Great, a character asks: Kaun se zamane mein jee rahein hai aap? Exactly the question on my mind as I watched this film. Because director Anil Sharma and Sunny Deol still seem to be stuck in the 1980s. Singh Saab The Great is a singularly soul-sucking experience. It doesn’t even work as unintentional comedy. I’m going with one star. Singh Saab The Great (UA) is yet another film about a righteous man’s fight against corruption. The film, therefore, becomes a routine revenge drama despite promising to be a unique fare. On the whole, Singh Saab The Great is a routine action and revenge drama for the masses only and has some chance in the single-screen cinemas, more of Northern India. Its business in the multiplexes will be weak. In the final tally, it will entail losses to several of its distributors. Anil Sharma’s Singh Saab the Great has its heart in the correct place. Sunny Deol’s earnestness shines, throughout the duration of this melodrama. But these guys have to choose better plots to make a point. We’ve seen a honest collector single-handedly trying to tackle corruption a zillion times. ultimately the film is just reduced to a trite, over-the-top Bollywood hit-and-holler affair. And the treatment; ouch, it hurts more than the hero’s blows. Then fists of fury fly; a crass item song is sung, a sting operation is conducted and good triumphs over evil. To be fair, the scene of the central conflict – where the protagonist must choose between a loved one and his principles – is solid and sets the tone effectively. This would’ve been a wonderful story if it had been more subtly told. Singh Saab the Great, however as you might imagine, is anything but. Singh Saab the Great is not to be taken seriously. But certainly for lessons in how to charm the ladies less than half your age, give it a shot. The first half of Singh Saab the Great is enjoyable but overshadowed by the loud, sometimes nonsensical music. The other half is unnecessarily gory and overshadowed by even louder and more nonsensical music. 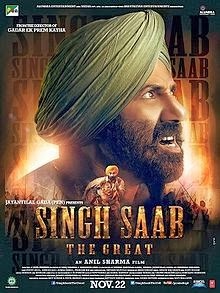 Although I appreciate that the makers of Singh Saab the Great tried to make a socially conscious and relevant film, they got pulled into giving a sermon instead. Singh Saab the Great has its moments. But more importantly, it has Sunny Deol and that is reason enough for most of us to watch this film. It’s all about Sunny and his dhai kilo ka haath in this two and half hour display of brawn over brain. Dialogues are written keeping in mind the single screen audience with Deol screaming his lungs out for most of the part. Second half and the climax could needed to be tighter, especially when there is no unpredictability in the outcome. Strictly for Sunny Deol fans, Singh Saab tries to recreate the glory days of this actor-director duo but doesn’t succeed beyond a point. in Singh Saab The Great, Sunny delivers a wallop. Looking every inch the Sardar in-charge, he furnishes the film with a flair that is quite engaging. While the plot tends to sag under the weight of italicized cliches, the twists and turns are negotiated by the technicians with ample aplomb. There is a virility and fluency to the storytelling. Singh Saab The Great is a homage to the cinema of the 1980s when Sunny was the daredevil determined to bring on a social reform. Somewhere, that hero lost his way. It’s good to have him back.